Following a 3-1 loss to the Adirondack Phantoms last night, the Wilkes-Barre/Scranton Penguins (WBS) finished up the first quarter of the 2013-14 season with a 12-5-0-2 record, good for second place in the American Hockey League’s (AHL) East Division. The WBS Pens sit 4th in the Eastern Conference and 6th in the AHL after 19 of 76 games played. For a daily look at the Pittsburgh Penguins top minor league affiliate, look no further than Highland Park Hockey! Follow @H_P_Hockey on Twitter for all the latest breaking news, injuries, call ups, game previews, recaps, practice updates and more! Megna has come into this season and elevated his game to new heights that I’m sure many in Wilkes-Barre thought were unimaginable. Starting the season in the AHL, Megna dominated the ice; scoring two shorthanded goals in his first four games before earning his first NHL call up with Pittsburgh after an October 20th game in Manchester. 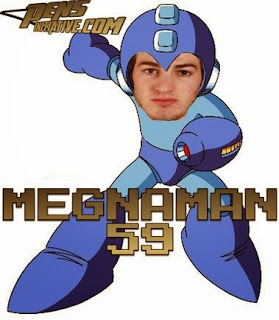 Megna wasted no time in the NHL, recording his first NHL goal and an assist in just his 2nd game with the NHL Penguins. Upon being re-assigned to Wilkes-Barre in time for a November 15th match up with division rival Syracuse Crunch, some thought an NHL hangover would ensue. Not even close. Megna continued to dominate at the AHL level, recording a point in each of the five games he played after returning from Pittsburgh and it wasn’t long before he was given a second look by the NHL club, as he is currently on the NHL roster after playing in last night’s 6-5 shootout win. 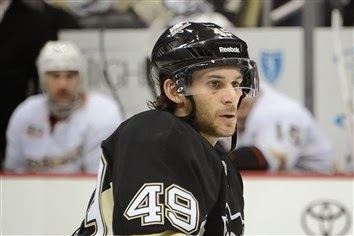 Another forward in the Penguins prospect pool making big strides is Brian Gibbons. Gibbons had blazing speed and shiftiness last season but the pucks weren't going in. This year, they are. And in bunches. Gibbons has been a top line staple at the AHL level for the Penguins, posting above point-per-game numbers and currently sits 5th in the AHL in scoring. The smaller forward uses his speed and skating ability to blow by defenders, especially on the penalty kill. No one made a bigger impact in their first NHL stint than Gibbons, who recorded his first NHL goal and an assist in his NHL debut with the Penguins back on November 18th against the Anaheim Ducks. Gibbons is currently back in the AHL with the Wilkes-Barre/Scranton Penguins but with the injury bug hitting Pittsburgh hard lately, Gibbons is probably the next forward in line for an NHL promotion. Being the odd man out on the NHL blue line, a disappointed Despres began the 2013-14 season in minors. Instead of sulking, the big defenseman continued to work even harder to round out his game in an attempt to be even more NHL-ready when he was next called upon. He appeared in his first NHL game of 2013-14 last night. At the AHL level, Despres was a workhorse, playing a shutdown role on the top pairing alongside teammate Philip Samuelsson. Despres logged big minutes on the PK and while playing defense was what he was in the AHL to hone on, he also logged power play minutes and put up some pretty impressive offensive stats in 17 games with the AHL Penguins. His +13 is also good for 2nd best in the AHL. After a 20-goal sophomore season in 58 games last year, I had Thompson penciled in the AHL Penguins top-six with another 20 goal season on the horizon. After the first quarter of the season, Thompson is goal-less and has fallen out of favor with the coaching staff, often sitting out as a healthy scratch. With the injuries and subsequent call-ups to Pittsburgh, now is as good a chance as ever for Thompson to get more ice time and start producing like he did while on the top line with the AHL Penguins most of last season. Maybe I’m being a little hard on Kuhnhackl, who is still considered a rookie after missing most of last season after having in-season shoulder surgery to repair a separated shoulder. With just one goal in his last 11 games, he certainly needs to elevate his game while five AHL Pens forwards are currently in Pittsburgh. One other thing to note is that Kuhnhackl got off to a slow start offensively last year too before starting to produce before the season ending injury last December. Seeing Dumoulin in the “trending down” column might come as a surprise to some, but after missing opening night recovering from an injury sustained in training camp, Dumoulin hasn’t been quite as impressive as he was last year in his rookie season. Dumoulin’s offensive numbers aren't down from last year, and while I’m not advocating that Dumoulin has been hit with the “sophomore slump” tag yet, he might have set the bar a little high during his first pro season where he was on the top pairing most of the year. Compare Dumoulin’s numbers with that of rookie Scott Harrington (19GP, 2G-6A, +6) and you’ll see why he’s listed here. Deslauriers has come in on an AHL tryout and is the clear number one goalie for the AHL Penguins. Hartzell won his AHL debut and looked impressive, but it’s too early to tell what the future holds for him. Expect him to remain in the AHL now with the disappearance and subsequent suspension to fellow goalie Peter Mannino for failure to report to Wheeling (ECHL). Mikkelson has come in and played well in his first season with the Penguins organization. He’s been known for clutch scoring this season as both of his goals are overtime game winners. Mikkelson has been a top-four defenseman for the AHL Penguins all season and logs big minutes on special teams as well as in important situations in-game. He’s also been a good mentor to rookie defensemen Scott Harrington and Nick D’Agostino, as Mikkelson brings the most pro experience to the AHL blue line. Harrington is doing just fine adjusting to the pro-game through the first quarter of the season. Playing in some AHL playoff games last season is really adjusting the learning curve for him this season. Harrington has played on the 2nd team special teams units on both power play and penalty kill and continues to develop his two-way game. Samuelsson hasn’t scored his first goal of the season yet, but he has been playing well on the top pairing in a shutdown role and has been shutting down opposing teams top players so far through the first 19 games. The rookie offensive defenseman from Cornell has been the teams 6th/7th defenseman thus far and is still adjusting to the pro-style game. Personally, I believe he has one of the best shots on the team and needs to shoot the puck more often. McNeill had been splitting time with D’Agostino on the third pairing so far this season until an upper body injury has sidelined the stay at home defender. Stevenson started the season injured and was sent to Wheeling to get in some games before being recalled by the AHL Penguins earlier this month. Stevenson, like McNeill, is a big physical stay-at-home type defenseman. Team-captain Kostopoulos has been a leader both on and off the ice. His five power play goals are more than twice as many as anyone else on the roster (four others tied with two apiece). Ebbett has been the most consistent of the AHL forwards not named Gibbons or Megna, posting at near point-per-game level before his first NHL call up of the season this past weekend. He recorded an assist on a nice set up on Chris Conner’s goal last night in his first NHL game with the Penguins. Zolnierczyk has been a nice addition to the AHL Penguins this season, as the speed and experience he adds to the team has been a nice compliment with that of line mate Brian Gibbons. Harry Z has been a staple on the PK for the WBS Pens this season and with the injuries in Pittsburgh, he’s getting top line minutes and extended looks on the power play in the AHL. Conner is another guy that has played well while in the AHL and is currently in Pittsburgh with the NHL Penguins, scoring his first goal of the season last night against the Toronto Maple Leafs. Drazenovic has missed time as of late with an injury, but was producing at point-per-game levels in the AHL before the injury. With the call ups in Pittsburgh, the AHL Penguins are hoping Drazenovic can return to action soon. Uher continues to improve in his 2nd pro season. The feisty Czech grinder has already outdone his offensive point totals from his 53-game rookie season (4G-3A) and is currently getting an extended look in the AHL Penguins top-six forward core. After 276 regular season games at the AHL level, the 5th year pro finally got his first NHL call up earlier this month. Sill is your prototypical 4th line center who plays a solid defensive game and is well-suited for a gritty, grinding 4th line at the NHL level. The second year power forward is a physical specimen at 6-3, 218 pounds. Payerl is great in the corners and around the net, but needs to better use his size and be a little more physical if he wants an extended look in the AHL Penguins lineup outside the bottom-six role he’s played in this season. Carman is a guy that has impressed me since day one as a reliable bottom-six center who plays a simple yet effective game. Farnham is easily becoming one of the most hated men in the AHL. As long as he doesn’t hurt the team’s chances to win by taking too many unnecessary penalties, he’s a solid option on the fourth line wing for the AHL Penguins. Leblond returned to action last night after missing several games with an upper body injury. The team’s enforcer has protected his teammates and been a solid option on the 4th line this season. Sylvester has filled in nicely on the 4th line after being called up last week and tallied the game winning goal in Rochester in his first AHL game November 20th. Manderson is another guy called up from the AHL Penguins affiliate in Wheeling (ECHL). A former line mate of Beau Bennett’s at Penticon (BCHL), Manderson has centered the 4th line for the AHL Penguins as of late. After off-season shoulder surgery slowed his rookie season, Zlobin was sent to the ECHL to get playing time and has looked well in six games with Wheeling.